We recently watched our friend Carl receive his Bachelor's of Science in Business Administration. For four long years, Carl has been working at least full-time (sometimes far more) and taking classes at night. And in all that time, he's been an amazing dad who always has time for his daughters (my goddaughters, Kylinn and Ellia). To say we're all proud of him is a great understatement. What a privilege to be there for his big day! Happy International Rabbit Day, everyone! I thought it would be fun to celebrate by playing a game of "Find the Rabbit." It's simple. Just find the rabbit in each of the following pictures. We'll start with an easy one. The cottontail is a dead giveaway from this angle. Trouble is much harder to spot from the front. This one is really hard. Look for a light colored ear sticking up. When Trouble is outside, we never take our eyes off him, not even for a second. Inside, where he is safe from predators... well, that's another story. At least 10 times a day, I get to play the indoor version of "Find the Rabbit." Again, we'll start with an easy one. Not difficult if you happen to be facing the correct direction. Here's another favorite nap location. He's easy to see in this photo, but the first time he snoozed on one of our dining room chairs, it took me 30 minutes of panicked searching to find him. I was terrified he'd gotten out somehow. Our bunnysitter had the same experience a few months later. Trouble isn't actually hiding in this next picture, but it's too cute not to include. Trouble likes to climb into any container he can find, including way-too-small Kleenex boxes. You can find cute videos of Trouble and lots of rabbit-themed projects and crafts here. For more information about rabbits and rabbit care, please visit the House Rabbit Society website. Happy International Rabbit Day! 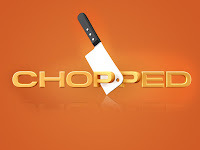 We are big fans of the Food Network show, Chopped. Remember the Chopped Challenge I did as part of my 40th birthday celebration? We still talk about it. One of these days, we'll do it again since it was totally awesome. In the meantime, I've become obsessed with thinking about what basket combinations I'd put together if I were in charge. I've loved the themes they've done recently, particularly the "Wasted" episode from this season. With that in mind, I've thought of a brilliant (if I do say so myself) idea for Chopped baskets. Still, there have to be four items for a Chopped basket. Three won't cut it. I kept thinking and thinking and eventually came up with two sets of four. Then I googled "rhymes with _____" to find a fourth item to go with one of my trios. I present to you... my Chopped Baskets! Something tells me the contestants (and judges) won't be particularly happy about any of them. Yesterday, I shared my first "Y" craft, the Yellow Yarn Yolk. Here's the other one I made, a Yellow Yo-Yo. Materials: yellow, tan/brown, and blue cardstock, a screw-style bottle cap, white yarn or string, glue, scissors. Begin by tracing your hand on the tan/brown cardstock and carefully cutting it out. Set it aside. Cut (or punch) two circles from the yellow cardstock. Glue them on either side of the bottle cap. Glue the end of the yarn to the side of the bottle cap, then wind it around until the bottle cap is no longer visible. Leave about 6 extra inches of yarn, cut it off, then tie a loop at the end. Slide the loop over the middle finger of the cut-out hand. Glue the hand to the paper. I chose to leave the fingers loose. Gently pull the string taut and glue the yo-yo to the paper. I really like how this turned out. Another fun addition to my Children's Crafts from A-Z! Yak. There are plenty of cute yak crafts out there - no reason to reinvent the wheel. Yam. No matter what I do, it's going to look like a sweet potato. Yacht. What young child wouldn't look at it and think it's B-is-for-Boat? Yeast. Not a very fun or eye-catching craft. Yeti. Do little kids know about yetis? The only reason I do is because of Rudolph. Yardstick. Unless it was 3 feet long, it would probably look more like R-is-for-Ruler. Hmm.... Yarn. Yolk. Yarn yolk? A yellow yarn yolk? Yes! Materials: cardstock (silver, reddish-brown, white, yellow), yarn (yellow, white), scissors, glue. Cut a frying pan from silver cardstock and set it aside. To make the bacon, cut a rough rectangle shape from the reddish-brown cardstock and add white yarn. Glue it to the frying pan. To make the egg, cut a rough oval from white cardstock. Cut a circle from yellow cardstock and cover it with glue. Starting from the center, place yellow yarn onto the wet glue, winding it around until the cardstock is covered. Snip off the end. Glue the yolk to the egg white and the glue the whole thing to the frying pan. Now, before anyone says anything.... yes, I realize this looks a lot more like F-is-for-Frying-Pan, B-is-for-Breakfast, or E-is-for-Egg. How's this? Convinced? If so, great. If not, return tomorrow to see my totally legitimate, no doubt about it, Y-is-definitely-for-Yo-Yo craft. I'm always up for a challenge, so I jumped in. Upon careful inspection of the elements, I realized that there were only a few ways they could go together. The red polka dot paper was cut as an envelope liner. The diagonal striped paper fit vertically onto the turquoise card base. The white sentiment card (which is hidden in the above picture) also fit vertically onto the base. The piece of baker's twine was not long enough to wrap around the card, so it was obviously intended to thread the button. I used the baker's twine to thread the button, but wasn't happy with how it looked. So I cheated a bit. I swapped out the small 4-hole red button for a slightly larger 2-hole button and ditched the green & white baker's twine in favor of green embroidery floss. I gathered my other supplies: a Fiskars Christmas sentiment stamp set, some silver ink, silver embossing powder, and some teensy rhinestones. What a fun challenge! Thanks, Amanda! After making our Caterpillar Cakes, we had plenty of extra cupcakes and green frosting left over. We brainstormed and decided to make Monster Cupcakes. Trevor and I went to the pantry and started digging around, looking for interesting materials to decorate our monsters. Then we sat down to start frosting. The plan had been that we'd each make our own, then one of us would make a second one for Steve, who was in his office working. But right at that moment, Steve came out for a break, saw what we were doing, and decided to join us. He said it was his first time using a piping bag. Surprising, given how often we use them around here! Trevor showed him just what to do and he picked it up quickly. He was very proud of his Monster! He used candy eyeballs, three Mike & Ike candies, a gumdrop, and red licorice. Here's Trevor's. He used five candy eyeballs, Mike & Ike candies, a pretzel, a gumdrop, and blue licorice. Here's mine. I used candy eyeballs on green gumdrops (attached to the cupcake with pretzels), Mike & Ike hair and nose, and a licorice smile. I love how different they all are. Such a fun activity! It's time for September's Project 41, my effort to try each flavor-of-the-month at Baskin-Robbins with a different friend as a year-long celebration of my 41st birthday. 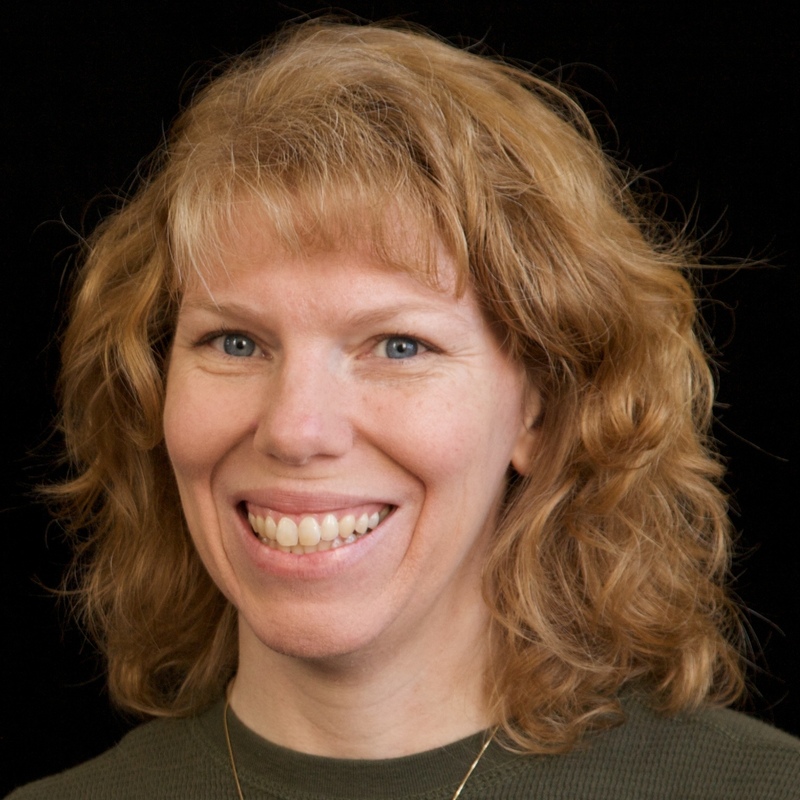 This month, my companion was my friend Amanda. I've known Amanda for about 4 years. 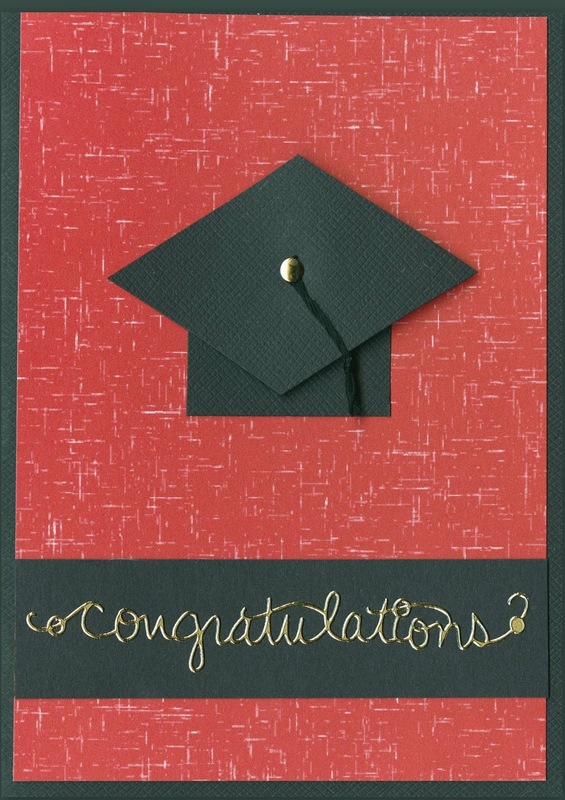 One day, I was browsing through the gallery at Scrapbook.com and saw a graduation layout with the name and colors of Steve's small-town high school. I left a comment saying that my husband had gone to the same high school. We exchanged a few messages. It turns out that Amanda was a good friend of Steve's younger sister. What a small world! We became good online friends. Amanda and I met in person in the fall of 2010 and traveled together to CHA in January of 2011. We'd seen each other only once since then when we attended an Amy Tan / Kelly Purkey workshop together in April of 2012. On to the ice cream. September's flavor-of-the-month is German Chocolate Cake. It is described as "Swiss chocolate ice cream with coconut, walnuts, and fudge brownie pieces wrapped in a caramel swirl ribbon." Here we are. It looks like we were sharing one scoop, but I assure you that she was holding her own ice cream just out of the frame. The problem with ice cream is that you can't spend too much time working to get the perfect picture! This is a Stampin' Up card kit. She explained that all the pieces were included, but that she was not going to show me what the completed card is supposed to look like. Challenge accepted! I'll share my version of the card next week. Another awesome month of Project 41! Six months ago, I added a page to my blog called Children's Crafts from A-Z. When I made it, I was missing 8 letters. Since then, I've added a Jellyfish, a Koala, a Nest, a Quail, a Volcano, and an X-Ray, leaving only two missing letters. Today I'm checking the letter U off the list. I started by brainstorming U-words that make great crafts for young children. Ukelele is ok, but many preschoolers and kindergarteners would guess that it was the more-familiar guitar, thus defeating the whole point of the alphabet craft. Unicorn is ok, but not excellent. Urchin? Hmm. There's a reason there are a LOT of umbrella crafts out there. My absolute favorite umbrella craft is this one by Mama Jenn. It is so cute and uses such a fun technique. After gluing an umbrella shape to construction paper, she had the kids put dots of white glue all over it, then hung it up to dry. Gravity made the glue run down, giving the look of rain. Fun, right?! I love everything about it except that the glue dries clear. I thought the wet version looked just a bit cuter than the dried version. White glue dries clear... what would dry an opaque white? A-ha! Enamel Accents! I go back and forth about whether I prefer her blue sky or my grey, or her clear raindrops versus my white raindrops. Overall, I think I like her project better... and it would certainly be more practical (and cheaper) to use white glue instead of Enamel Accents. But I had a lot of fun experimenting and making my own version. And I can finally scratch the letter U off the list! Pantone released their Spring 2014 Color Report last week. As I've mentioned many times, I don't follow fashion AT ALL (other than being a huge Project Runway fan), but I do pay attention to Pantone's reports. The same colors that trend in the fashion industry trend in the craft industry. Expect to see these colors dominating the paper lines and other scrapbook and craft products that debut at the Craft and Hobby Association winter trade show. Overall, I like the palette. I love the addition of Paloma and Sand as neutrals. As for the rest of the colors, it's not all that different from 2013's.... with one major exception. While Grayed Jade, Dusk Blue and African Violet will give way to the very similar Hemlock, Placid Blue, and Radiant Orchid, there is no corresponding shade for Emerald, the 2013 Color of the Year. We're going to have to wait awhile to find out what 2014's Color of the Year is, as the Color of the Year is typically announced in December. You can see the previous 14 winners at Pantone.com. It's pretty interesting. So what do you think of the 2014 colors? Last week, Trevor's Cub Scout homework was to do the meal planning, preparation and clean-up for a day. Of course, when you assign a 7-year old a job like that, you are assigning the parents an even bigger job - supervising it all. As soon as he woke up, Trevor gathered up all his cookbooks and started his planning. I sat back with the camera. He selected his entrees and sides, put them all on his homework sheet, and then made a grocery list. picture of Trouble sitting next to Trevor, "reading" what he was writing. On his menu for breakfast: Cheerios with milk, and Orange Juice Mocktails. Orange Juice Mocktail is our family's special occasion drink. To make it, fill a glass 2/3 full of orange juice. Then pour in 7-Up until the glass is almost full. Add about a tablespoon of grenadine. Next, we headed to the grocery store. I didn't think to take pictures, which I regret. It was cute seeing Trevor selecting items, checking prices, and trying to make good choices. For lunch, Trevor prepared peanut butter and jelly sandwiches, chips, and two kinds of fruit. Trevor has very little knife experience. He struggled spreading peanut butter and jelly, which was an eye-opener for me. I hadn't really realized that I always do it for him. (That will be changing.) 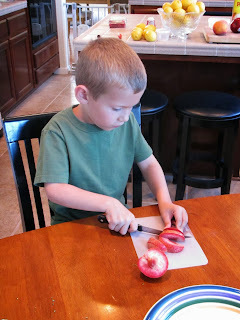 He'd never used a sharp knife to cut wiggly, juicy fruit and was very nervous to try. I was nervous about stepping back and taking pictures, but he did the job perfectly. For dinner, Trevor chose to make Crispy Chicken Strips, steamed broccoli, and two fruits (different than the two for lunch!). Trevor has a fair amount of cooking experience, but he had never worked with raw chicken, so we spent quite a bit of time talking about how to avoid cross-contamination. Here he is, ready to get started. He did an excellent job getting the chicken strips ready, but was too scared to put the pan in the oven himself. So I did that part. He was also very nervous about turning on the gas stove to steam the broccoli, but he did eventually conquer his fear and turn it on. Wolf Achievement #8 b, c, and d complete! Clearly, 1/4 c. of batter was too much. OK, good to know for next time. We used a serrated knife to level off the bottoms, then arranged the cupcakes on plates. Trevor had requested that we make caterpillars, so that's exactly what we did. We used a star tip to apply green frosting, then added candy eyeballs, pretzel antennae, a red licorice smile, and grape licorice feet (affiliate links). By the way, we actually researched caterpillars to learn how many legs they have. We learned that they have 6 true legs (which they keep in adulthood as butterflies or moths) and up to five pairs of prolegs. These false legs help them move and cling to plants. Never let anyone tell you that cake decorating isn't educational. Here's mine. Trevor took the picture and he kept telling me to get lower and lower until I was laying on the table like this. Here's a close-up of Trevor's caterpillar. "Hello!" I made WAY too much green frosting, so expect a different green cupcake project from us in the near future. Are you familiar with Accelerated Reader (AR)? If not, read about it here. I first learned about AR when I started teaching. I joined the rest of the upper grade teachers for a training in San Francisco on how to use it properly and was instantly a fan. I only wish it had been around when I was a student! When Trevor started kindergarten, I was happy to learn that his school used Accelerated Reader. They run it a bit differently than the way I was trained to do. (Of course, that was about 15 years ago!) One difference is that they measure and reward the number of words read vs. the number of points earned. 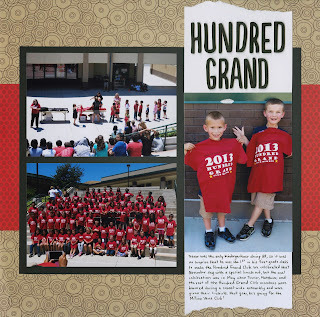 When kids at Trevor's school reach 100,000 words, they become members of the Hundred Grand Club and are recognized in a school-wide assembly and given a special t-shirt. Trevor fell just short of 1,000,000 words during first grade, so that's his goal for second grade. 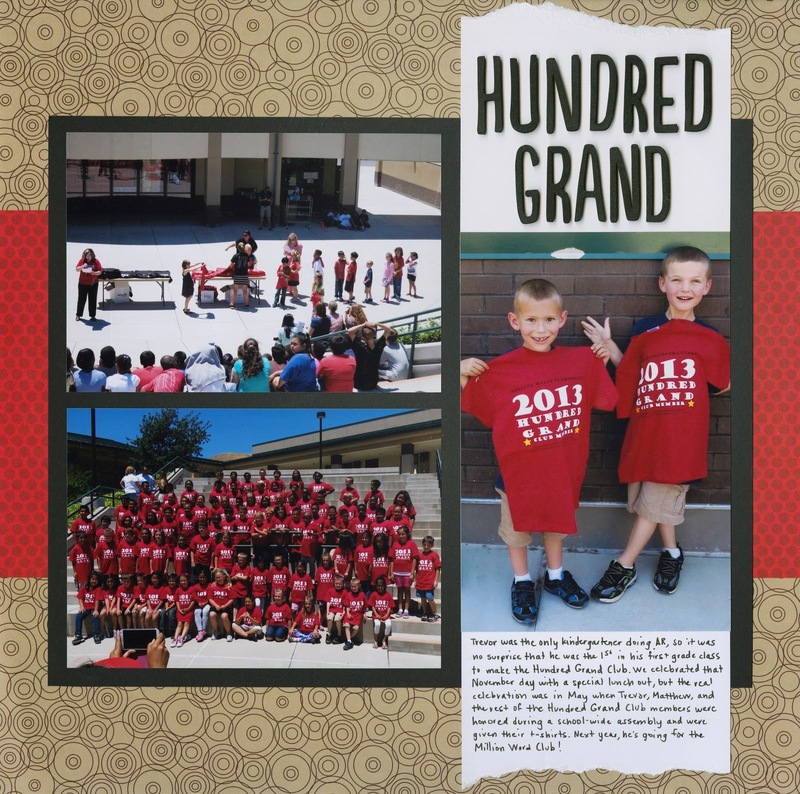 Hopefully this time next year, I can share a layout with pictures from the Million Word Club assembly!